We have been listening to this cd in the house and in the car. My favorite song is I'll Be Home For Christmas, (maybe because I am so looking forward to having all of my children together again). I love the lyrics to this classic, but Chris puts an upbeat twist to it. My kids like Tell Me What You Want For Christmas the best. They really like the silliness to the lyrics & were even laughing while they listened to it the first time. We love the sound of this cd, my kids think it isn't as Christmassy sounding as the rest of my collection so they said they could listen to it all year. I agree, the words an music go very well together with the feeling of Christmas. It has put me in the mood to get out my Christmas tree and decorations. I love the upbeat tune throughout the songs, and we are all singing along. My daughter is already thinking of singing Jesus, Savior at church when it gets closer to Christmas. The Christmas EP has definitely gained a spot in my Christmas sleigh basket that is if it ever gets out of the cd player. You can stay in touch with Family Christian, Chris August, and The McClanahan 7 on their Facebook pages. I have a $10 Appreciation Certificate that can be used at Family Christian online to giveaway to one of my lucky readers. Just enter the Rafflecopter below. 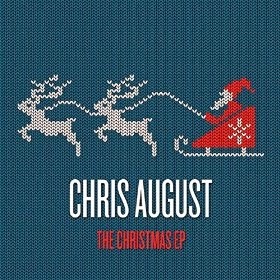 Disclaimer: I received a free copy of Chris August The Christmas EP from Family Christian in exchange for my review. They also supplied the $10 appreciation certificate to giveaway. All opinions are my own and no other compensation was received. I love Christmas music too. I'm going to use the $10 certificate to buy mugs for my kid's teachers for their Christmas gifts. I would purchase a new wallet for my husband! Oh, I might have to get that Chris August EP (How'd you score that? He's one of our favorites!) or possibly Sidewalk Prophets' Christmas Album... another favorite! Maybe "Courageous" and the Veggie Tales devotional! I would like to get the willow tree friendship ornament for a friend. I'd like to get the Demdaco nativity set. If I won, I might buy some board books for our granddaughter. It would have to go toward a new nativity set! I would use it to buy the Blink: Bible Edition Card Game. I'd probably get something Advent related for my kids. I'd like to buy a Max Lucado book. Veggie Tales DVD`s for my toddlers for Christmas. I'd like the 1 Girl Nation Christmas CD. I like the children's nativity sets. Thank you for the giveaway. I really want a devotional for moms! I would use it on either the veggie tales books for my children or a nativity set for my mother in law. I would use it towards the be strong and courageous plaque. I'd spend it on a Veggietales DVD For my kids! I would use it toward Livia- Stuffed Animal Hippo! I'd buy a Mandisa cd! I would get a movie to watch. Apocolypitc Triple Feature caught my eye. I'd love to get "Rose Book of Bible & Christian History Time Lines"
I want to buy a Neverclaim cd. I would get a devotional book for my family. I'd like to get more What's in the Bible DVDs for my little guys. Sounds crazy but I love their Christmas Cards! I want to use the G/C to buy the Sanctus real CD! I really would love a bible carrier. The new Tenth Avenue North cd! Courageous movie or Gods not dead! Be Strong and Courageous Wooden Canvas - 16" x 20"
I would put it towards a Women's It Is Well Hooded Sweatshirt - Navy. They have so many cool things! I would buy Son of God DVD. I would get the Peace on Earth Mason Jar Mug! If I am lucky enough to win I want to get one of Michael W. Smith's CD's. I don't have any of his CDS yet and I've been wanting one for a long time. My husband loves his music too. Thanks for this chance to both you and the sponsor. I would apply it toward the purchase of the Little People Advent Calendar for my kids.